We've seen what the Takara Tomy Mega Drive Megatron looks like in-hand a while back - but had you considered owning it in gold and translucent plastic? Thanks to fellow Seibertronian durroth, we've spotted the item on Famitsu, as part of a Sega promotional campaign. It boils down to purchasing the upcoming Sega 3D Reprint Archives, between 18th December 2014 and 31st January 2015, and filling in an online questionnaire. You may have to be a Japan resident, but you can find out more here. In the meantime, check out the images of the figure below! 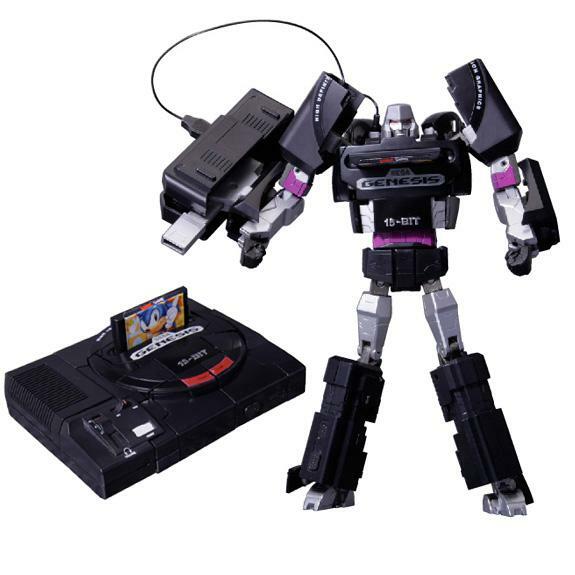 Prizes  "Transformers Mega drive Megatron Gold Ver." 5 people Tomy of sale than Hobby brand "NEXTA" of Arts "Mega Drive" and "Transformers" was collaboration "Mega drive Megatron" This is campaign the Gold version of only to the custom order. Miniature cartridge accessory that can be set to cassette outlet of the chest, " Sega 3D reprint Archives Mega Drive version that is included in "" Streets of Rage in ", has become a different special specifications and product version. So wait, is this a lucky draw version of a figure that's currently the only one of its line? I wonder how much that would go for on the secondary market. It's nice but it's out of my reach. 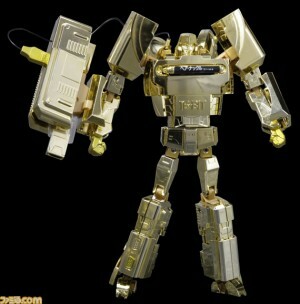 Along with the news of the Gold Mega Drive Megatron lucky draw figure, Takara Tomy A.R.T.S. and Sega have tweeted photos of the mold in a new deco. This redeco adds the Sega Genesis logo to the console mode and changes the red paint operations for purple. This will be a run limited to 1000 pieces available for purchase. All the pictures regarding this new deco have been mirrored below. Me wants! I don't care he doesn't play any games, he's just perfect like that. Autobot Tap Out there isn't an N64 one. Plus they haven't done the same generation of consoles as the playstation went against the Saturn, not the mega drive. ZeroWolf wrote: That looks amazing, wonder if they would do a retool into the Mega Drive II and Galvatron (or a Saturn, Dreamcast I'm easy takara). Or they could do a Sega CD/32X add-on as Tidal Wave. It's a shame that chrome would probably chip like crazy, because it looks divine. Tonight we're gonna party like it's 1989! Cool that it looks like they've even remolded his little cart into a Genesis shaped cart. They could have really cheaped out and not done that. Good for them. Really wish both Megatron and Optimus would come out in the U.S. as a 2-pack of some sort. SEGA would probably be for it. I don't know about Sony though due to SEGA signing a contract with Nintendo to have 3 exclusive Sonic games. Third-party licenses don't come that easily in the U.S. This thing is a disgrace, it wont stand because the feet are too small. Oh I know, I was just refuting the claim it wasn't coming due to a game deal. Limited at only 1000 copies?! How much will that thing cost? @SEGA_OFFICIAL has tweeted an in-package image of the gold Mega Drive Megatron. This is part of a Sega promotional campaign for Japanese residents by purchasing the upcoming Sega 3D Reprint Archives, between 18th December 2014 and 31st January 2015, and filling in an online questionnaire to be able to win. 5,229 pages were recently viewed by 588 unique visitors. This page was viewed 1 times on Monday, April 22nd 2019 11:50pm CDT. © 2019 Seibertron, Inc. DBA Seibertron.com. All Rights Reserved. Established June 2000. Seibertron.com is owned by Ryan Yzquierdo.